Jeff Aikey of Waterloo, Iowa, continued his strong run in the Indee Open Series as he notched his third series win of the season with an impressive victory at Mineral City Speedway in Fort Dodge, Iowa, on Tuesday, June 13. 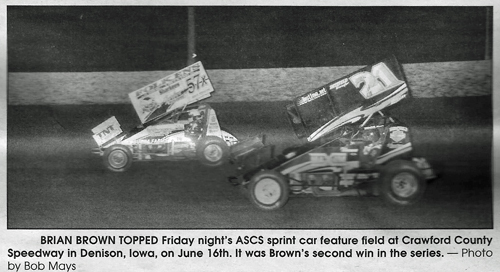 Mike Smith of Jewell, Iowa, took the lead at the drop of the green and pulled away from the field. Aikey settled into second-place on the ninth lap and went to work chasing down the leader. Smith maintained his sizeable lead until he encountered lap traffic just past the midway point. As Smith worked his way thru back markers, Aikey cut into his advantage and pulled even on lap 23. Aikey made the winning move with only five laps to go as he drove to his second straight series win. Smith, Curt Martin of Independence, Iowa, Gary Webb of Davenport, Iowa, and Steve “Ace” Ihm of Hazel Green, Wis., rounded out the top five. 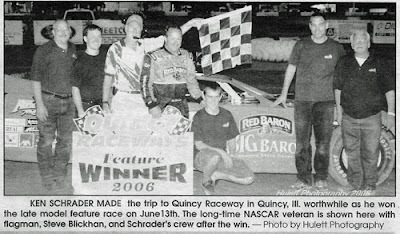 NASCAR Night at Quincy (Ill.) Raceways was a huge success with Kenny Schrader, Kenny Wallace and Steven Wallace competing with UMP late models, IMCA modifieds and bombers on June 13. All special guest drivers put on a great show with Schrader winning the 35-lap late model main, Wallace finishing third in the modified feature and Wallace also finished third in the bomber main in his first time ever on dirt. Competing in his 291st Deery Brothers Summer Series event, Darrel DeFrance of Marshalltown, Iowa, held off defending series champion Terry Neal of Ely, Iowa, to win the 35-lap feature for IMCA late models at Buena Vista Raceway in Alta, Iowa, on Wednesday, June 14. DeFrance passed Eric Gustaf of Moline, Ill., for the lead with seven circuits to and then had to fend off Neal, who had ridden the high side of the track from his 13th starting position. The win was DeFrance’s ninth career series win and paid the veteran $2,000. Neal, Rob Toland of Bettendorf, Iowa, Jeff Aikey and Gustaf rounded out the top five. 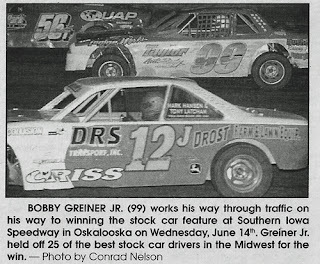 The third and final night was held at the monster half-mile Southern Iowa Speedway for the third annual Great American Stock Car Challenge with Bobby Greiner Jr. of Ottumwa, Iowa, coming out on top of an impressive 26-car field in the 35-lap finale on June 14. 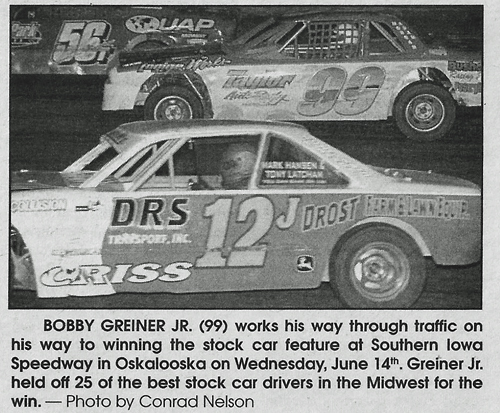 Greiner passed Tom Schmitt of Independence, Iowa, on lap 12 and then held off 25 of best USRA stock cars to collect the $3,000 winner’s share. T.J. Criss of Oskaloosa, Iowa, took second while Mark Elliot of Webster City, Iowa, worked his way from his 22nd starting position to finish an impressive third. Schmitt and Justin Temeyer of Independence, Iowa, rounded out the top five. In other action, Mark Elliot led all 20 laps to score the win in the USRA Modified feature and Nathan Wood of Sigourney, Iowa, took home $1,000 for his win in the USRA hobby stock A-main. Darren “The Thriller” Miller took advantage of a restart on lap 17 and negotiated traffic flawlessly holding off Earl Pearson Jr to win the 50-lap World Dirt Racing League event at Red Cedar Speedway in Menomonie, Wis., on June 14. 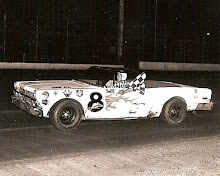 Pearson and Jimmy Mars raced wheel to wheel for the first 16 circuits of the main event with Miller in tow. On a lap 17 restart, Miller dove past Mars in the first turn and powered past Pearson in turns three and four to take the lead. 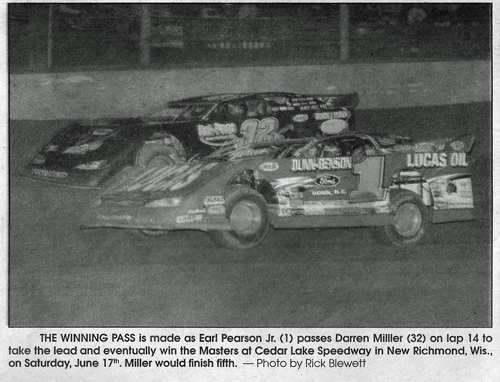 Miller held off a stubborn Pearson until lap 35 when Pearson was momentarily able to regain the lead but two laps later Miller pulled ahead for good and won going away at the checkers. Pearson, Mars, Dave Eckrich and Terry Anvelink were the top five finishers. Tim Kaeding scored his sixth series win of the season as the National Sprint Tour made its debut at the half-mile Davenport Speedway on June 14. Kaeding passed race-long leader Brian Paulus on a lap 17 restart and then had to withstand a furious charge by Kerry Madsen to seal the victory. Madsen appeared to have the horses to get by the young Californian for the lead and the win when the Australian ran out of gas with two laps left. 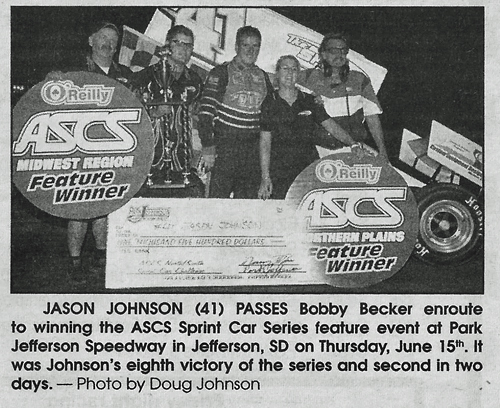 Kaeding’s teammate, Steve Kinser, would finish second followed by Jason Solwold, Jason Meyers and Shane Stewart. It was another night and yet another win for the “Ragin Cajun” Jason Johnson, as the Eunice, La., hot shoe scored his eighth American Sprint Car Series Northern Plains Region win of the season at Park Jefferson (S.D.) Speedway on Thursday, June 15. 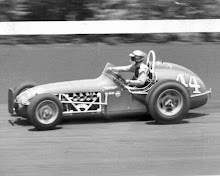 Johnson earned the pole position and outgunned front row starter Jack Dover at the drop of the green. 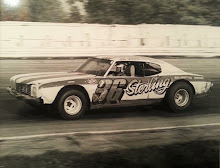 Dover kept the pressure on Johnson over the first half of the race before the 16-year-old racer from Springfield, Neb., tangled with Sam Hafertepe Jr. while racing for position. After the restart, it was all Johnson with Dusty Zomer a distant second. Micah Schliemann, Chuck Swenson and Jesse Hockett rounded out the top five. Justin Fegers roared past early leader Tommy Elston on the 18th circuit and went on to win the non-stop Budweiser 50, a World Dirt Racing League sanctioned event at Superior Speedway in Superior, Wis., on June 15. The victory was Fegers’ second series win in as many years on the 3/8-mile Head of the Lakes Fairgrounds after the Mound, Minn., driver picked up hi first-ever series win during the first of two stops there in 2005. Missouri’s Brian Brown foiled Jake Peter’s victory bid by wrestling away the lead for good on lap 21 en route to topping Friday night’s 25-lap American Sprint Car Series Midwest vs. Northern Plains Region feature at Crawford County Speedway in Denison, Iowa, on Friday night, June 16. Peters led from the onset until Brown battled into the lead on lap 19. Peters battle right back into the top spot a lap later, but Brown was not to be denied his second Midwest Region victory of the season as he reclaimed the lead a lap later and streaked to nearly a straightaway victory in the final laps. Peters held on for runner-up honors while Jeff Mitrisin took third. Jon Corbin and Eric Lutz finished fourth and fifth respectively. Earl Pearson Jr. roared from his fifth starting position and into the lead in just 14 laps to win the 50-lap World Dirt Racing League co-sanctioned feature of the 8th annual Masters on Saturday night, June 17. After grabbing the top pot, the man known in racing circles as “The Hurricane” survived five caution flags and multiple challenges from the likes of Darren Miller, Donnie Moran and Brian Birkhofer to pick up the prestigious event’s top prize of $10,000. Whenever you go to Dodge City, Kan., you can usually count on a ‘ol fashion wild west shootout and true fashion, that’s what fans got as the NCRA Late Model Series made a visit to Dodge City Raceway Park on June 17. In the end, Steve Kosiski held off defending series champion Kelly Boen to capture his third series win in four shows. 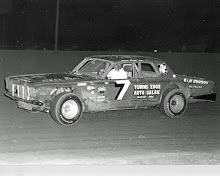 Boen, who had taken over the lead from Kosiski on lap 5, was sent to the rear of the field by NCRA officials for “rough driving”. With Kosiski comfortably in front, Boen was a man on a mission, charging from the rear of the field. 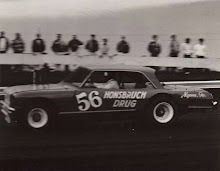 By lap 23, Boen was in tenth and on lap 31 he had cracked the top five. A caution with two laps left put Boen right behind Kosiski and Delbert Smith. On the final charge, Boen was able to power past Smith but was able to unseat Kosiski from the top spot and settled for an impressive runner-up finish while Smith grabbed the final podium spot. Terry McCarl of Altoona, Iowa, made a triumphant return to Huset’s Speedway, scoring a feature win on Sunday night, June 18. McCarl, who suffered a broken leg in a World of Outlaws event in Sharon, Ohio, on May 20, drove to his 78th career victory at Huset’s, in the outlaw sprint car division. McCarl, who started 12th in the event, methodically moved his way to the front and passed Larry Ball Jr. of Knoxville, Iowa, for the lead and eventual win. Jason Hughes put a stop to Kelly Shryock’s onslaught Sunday night before a packed grandstand at Monett (Mo.) Speedway - albeit by mere inches – to capture his first USMTS Modified feature win of the season on June 18. Shryock, who had won four of the last USMTS events, made a last-corner effort on the final lap to get around Hughes at the finish of the 35-lapper, but was denied his tenth win in 20 starts and had to settle for second place money at the pay window. Hughes pocketed $2,000 for the win. Jesse Stovall earned a hard-fought third-place while Tommy Myer took fourth after leading the first 22 circuits. Late model ace Terry Phillips rounded out the top-five finishers.